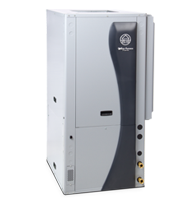 The WaterFurnace 7 Series™ provides homeowners the ultimate in comfort and performance and represents our finest products. This line is for those who accept only the best and is built using the latest technologies and highest standards. The 700A11's ratings are vastly greater than ordinary conditioning systems and 30% higher than current two-stage geothermal heat pumps. Our Aurora communicating controls work in unison with variable capacity technology. A variable capacity compressor, variable speed loop pump, and variable speed blower motor combine to offer a level of comfort you have to experience to believe. Best of all, 7 Series units use the stored energy in the ground to provide savings up to 70% on heating, cooling, and hot water.